Planning a wedding is a huge task - there is absolutely no reason you should have to do it all by yourself! Your mom, mother-in-law, maid of honor, bridesmaids, and/or other female friends can be hugely helpful, but don't leave out another equally valuable asset: your fiancé. The team at WhereBridesGo.com is here to help you out with some of these brilliant ideas for getting your groom involved. Your big days is just as much about the groom as it is about you - he should get to have equal say in the planning process. Not only that, but people are more apt to help out with something that they feel like they have some control over. If your groom feels like his opinion is valued and appreciated, he will be more invested and more likely to step up and take on some extra responsibilities. 2. Give Him Tasks He Wants To Do. Nothing inspires procrastination more than being assigned a job you don't want to do. 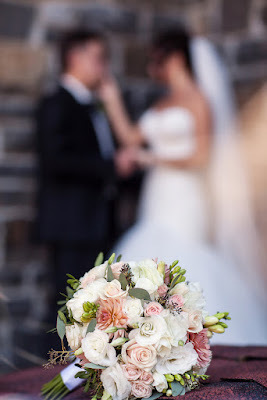 Rather than simply assigning specific tasks to your groom and expecting him to do them with a smile, ask him which tasks sound the most appealing to him. If he volunteers to coordinate with the caterer and set up tastings, let him! 3. Divide The Work Evenly. Planning a wedding together is like a crash course in marriage - it's means taking on a huge project that will require you and your fiancé to work together in order to succeed. Marriage works the same way; the best ones owe their success to constant cooperation between the husband and the wife. You can get your marriage started off on the right foot by evenly dividing the work of wedding planning between you and your fiancé. We all have different strengths. 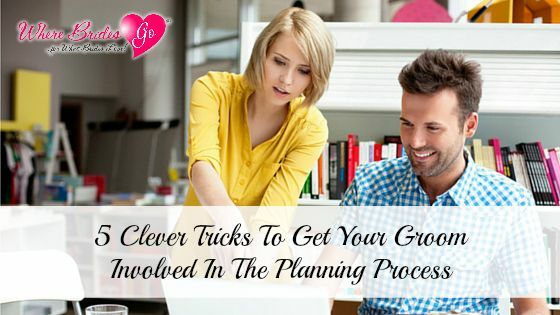 You can make your planning process easier on everyone by identifying your and your partner's strengths and dividing tasks accordingly. If he has an affinity for math, let him oversee the wedding budget. If he has a creative streak, ask him to design the announcements or the invitations. By maximizing each of your strengths, the planning process will go much more smoothly for everyone involved. Almost every argument you will ever have with your partner will stem from a misunderstanding. It won't be fair to hold your fiancé to certain expectations if he is not aware of what those expectations are! Try not to expect your fiancé to do certain tasks or make specific decisions without communicating your desires to him (and making sure he agrees with them) first. By coming together as a team, you and your fiancé can create the wedding of your dreams. If you find yourself in need of some wedding planning inspiration or unique wedding accessories, be sure to visit WhereBridesGo.com. We have a great selection of wedding gifts, decorations, and more. Happy shopping! Are You THAT Wedding Guest?